More flexible, more efficient processes paired with completely reliable status monitoring? Yes, VEGAFLEX 81 guided radar sensors can provide that, and also give the user a choice. 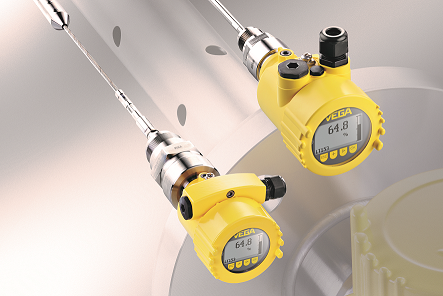 They combine level measurement and optional interface detection in one single innovative device. In addition to efficiency, they ensure an optimal price-performance ratio in many processes. “Two in one” is the motto of the skilful combination of two measurement applications built into VEGAFLEX 81. These multi-talent instruments are suitable for all types of liquids, whether in storage tanks, standpipes, dosing containers or large tank farms. The range of media they can measure with great precision ranges from bitumen to liquefied gases. Thanks to the special design, even ammonia can be measured without difficulty. Your advantage in terms of cost and safety: VEGAFLEX 81 needs only one mounting hole in order to measure the level and the layer interface continuously at the same time, particularly in pressure vessels. In addition to VEGAFLEX 81, which has been optimized for use in liquids, there are three more instrument versions in the guided radar series 80 – each designed for a special area of application. VEGAFLEX 82, for example, is ideal for measuring bulk solids under extremely harsh conditions. When foodstuffs or aggressive media have to be measured, VEGAFLEX 83 is the best choice. With its resistant materials and suitably finished surfaces, the instrument meets the high requirements of hygiene and durability. And then there’s VEGAFLEX 86, which is predestined for applications with extreme temperatures and high pressures, for example in distillation columns. VEGAFLEX series 80 guided radar sensors are maintenance free and ensure, not least thanks to their intelligent electronics, reliable measured values and safety for the entire processing facility. VEGAFLEX 86 measures practically any fluid, and that maintenance free under extreme pressure and temperature conditions, even in applications with heavy build-up, foam or condensate.